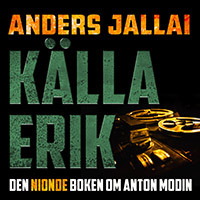 Anders Jallai, Sweden’s Number 1 self-published author of political thrillers, draws from his experiences with the Swedish Navy Seals and the Swedish Air Force in the final years of the Cold War. His background as a fighter pilot, a commercial airline captain, and a professional diver naturally flows into his edge-of-your-seat thrillers. His first three novels were originally published in Sweden. Now, Anders Jallai’s successful political thriller series about former Special Ops agent Anton Modin will be available in English. The series begins with Deep State, originally published in Sweden in 2010. Anton Modin, a middle-aged disillusioned former Special Ops agent who lost his wife and two kids in a ferry disaster, wants nothing more than be left alone in Grisslehamn in the northern Stockholm archipelago. However, that’s easier said than done if you were involved with more secret missions than you care to admit. Sweden’s Military Intelligence Special Ops was entrusted with keeping the peace between the East and the West during the Cold War, a time when Sweden’s geopolitical position as an immediate neighbor to the Soviet Union created more than one highly classified incident. Cover-ups, sometimes at any cost and by any means necessary, blur the lines between truth and lie, threatening even Modin’s moral compass as he navigates the Cold War secrets shared by Swedish Intelligence, British MI6, the CIA and Mossad. In the three books of the series Deep State, Enemy of the State, and Under Water, Anton Modin will dive for sunken Russian submarines, revisit the murder of Prime Minister Olof Palme, and uncover the secrets behind the sinking of the passenger ferry M/S Estonia. As much as it is a fictional journey into Anton Modin’s troubled past, the series is a historical journey into the uncharted territory of the Cold War as it was fought way up north in Swedish littoral waters. In 2003, Anders Jallai received an award from King Carl XVI Gustaf for finding the Swedish DC-3 shot down in 1952, an expedition for which he was also named “Project Manager of the Year” in 2004. He also received an award from Fleet Admiral Vladimir Kuroyedov, Commander in Chief of the Russian Navy, for finding a Russian submarine in the Baltic Sea in 1998. 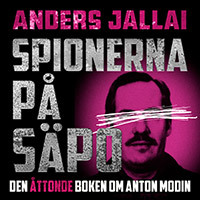 Anders Jallai is considered one of the most knowledgeable Cold War historians in Sweden, with a specialty in Stay Behind, Spy- and Black Operations. Svenska Dagbladet, Sweden’s leading daily.